Like many people who have seen TV programs discussing people who squander their lottery winnings, Ricky and Connie Ferguson have vowed not to make the same mistake should they win. Unlike most of us, they now have a chance to prove it. 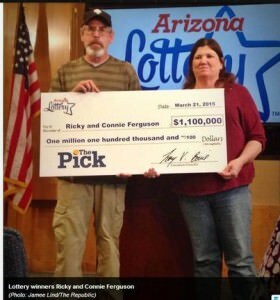 While on a hiking and photography trip to Heber, Connie bought a Pick 3 ticket at a Circle K. Only after they reached home did they learn that they have won a jackpot; they only learned it was for $1.1 million when the Arizona Lottery office opened the following day (Monday). It seems like the couple are on the right track as the first thing they did was consult with a financial adviser, and have stated that they will invest most of their winnings.